Notre Dame’s Lexi Smith looks to drop an attack attempt near the heart of the Clay defense. Clay’s Taylor Lewis leaps up for an attack attempt. ROSEMOUNT — Staying poised in critical moments is a huge part in any sport, because it separates the average programs from the good and the good programs from the great ones. On Thursday evening, two of the premier volleyball programs in Scioto County, once again, proved why they could very well be the teams to beat in the Division IV Southeast District realm as the volleyball programs at Clay and Notre Dame did battle in another thrilling SOC I matchup in Rosemount. At the end of the day, however, it was Notre Dame who emerged victorious, as a massive 28-kill, 14-dig performance from Lexi Smith, along with 12 kills from Katie Dettwiller, 43 assists from Cassie Schaefer, and 22 digs from Ava Hassel allowed the Lady Titans to outlast the Lady Panthers, 3-1 (23-25, 25-10, 25-13, 27-25) in the highly-anticipated rematch between the two programs at Clay High School. For Kelsey Glockner, the victory puts Notre Dame on the inside track to yet another outright SOC I crown. However, in addition to taking care of business the rest of the way, the SOC I title, if it does, indeed, become a reality, is only the first hurdle crossed in a list of goals. As for Jill Tipton, the defeat was disappointing in the sense of what could’ve been after Tipton’s Lady Panthers showed off the improvement that had been made in its 10-game winning streak. 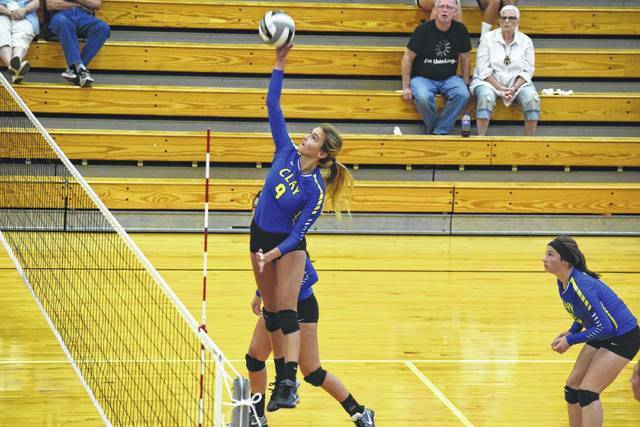 Throughout the first set, the contest certainly lived up to the hype — and then some — as the Lady Panthers and the Lady Titans traded the lead nine times over the first 17 volleys of action. But after falling behind by an 8-5 tally, it was Clay who would assume the controls of the affair early on behind the controls of Delanie Gilliland and Jensen Warnock. Gilliland obtained five kills and a block in the first set, while Warnock added four kills of her own as the Lady Panthers scored five of the final eight points to take home a thrilling first set. For the contest, Warnock, in particular, was nothing short of outstanding as the junior obtained 23 kills, 11 points from serve, and three aces to head the team in all categories. Warnock also added 18 digs and 17 service receptions, while Gilliland obtained 19 service receptions, 16 digs, 13 kills, and two solo blocks to round out great all-around performances from both players. Even after the first set loss — which put Notre Dame behind in an SOC I affair for the first time all year long — the Lady Titans, however, didn’t look phased. Throughout the second set, Notre Dame proved that point as Smith obtained seven kills on her own while Taylor Schmidt accumulated back-to-back aces in a 20-5 Lady Titans’ run during the second set that allowed Notre Dame to win going away, 25-10. Tipton, however, was befuddled at the difference in play from the first set to the second. As strong as the second set proved to be for the Lady Titans, the third set proved to be just as strong, if not even moreso. Behind a spectacular performance from Smith, who collected nine kills, two blocks, and an ace in the third set alone, Notre Dame established an early 8-2 advantage and even went on a surprising 10-0 spurt during the third set as the Lady Titans never trailed in a 25-13 victory in the third set of action. Overall, the trio of Smith, Dettwiller, and Taylor Schmidt proved to be hard to stop throughout the evening, with Smith and Dettwiller combining for 40 kills while posting attack percentages of .404 and .417, respectively and Schmidt adding six kills on a .353 attack percentage to go along with three crucial aces — including two in the second set of play. Clay, however, wasn’t about to just give Notre Dame the victory. Even though the Lady Titans vaulted out to a 10-5 lead in the fourth set of action, Taylor Lewis and Jensen Warnock teamed up to collect four crucial kills as the Lady Panthers cut the lead to a 16-14 margin. However, the contest still looked bleak for Clay, especially after five kills from Hash and Smith opened the Notre Dame lead back up to a 23-17 margin. But with the Titans just two points away from a victory, the Lady Panthers showed incredible resiliency by utilizing three Taylor Lewis kills and a block from the junior — who collected 14 kills, a solo block, and a team-high 23 service receptions on the day — to give Clay leads of 24-23 and 25-24 late in the fourth set. But with the game on the line, Glockner had the winning message. With that message received loud and clear, Notre Dame, behind two well-placed serves and a Katie Dettwiller spike, took care of business, as the Lady Titans miraculously took the final three points of the match back en route to winning the contest. With the victory, Notre Dame improved its overall record to 12-5 while also keeping its perfect SOC I mark intact at 10-0. 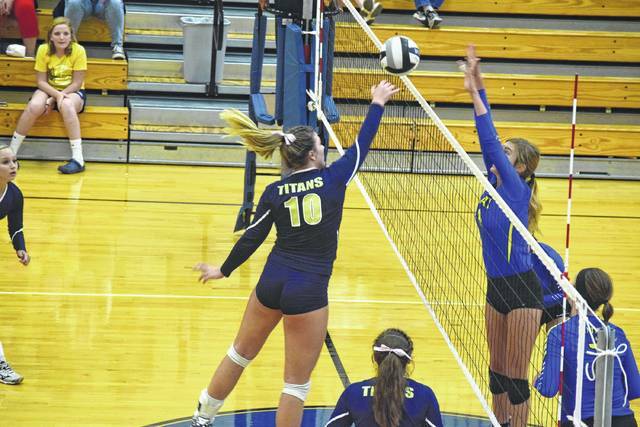 Victories in their next two SOC I matches (Symmes Valley, home, Tuesday and Eastern, away, Thursday) will mean that the Lady Titans will clinch the title outright. While the loss likely means that the SOC I title is out of the picture for Clay, the Lady Panthers, at 14-3 and 8-2 in SOC I play, still have plenty to play for. Tipton’s ballclub will play back-to-back contests at Valley and New Boston on Monday and Tuesday in order to tune up for postseason play. https://www.portsmouth-dailytimes.com/wp-content/uploads/sites/28/2017/09/web1_rsz_dsc_0107.jpgNotre Dame’s Lexi Smith looks to drop an attack attempt near the heart of the Clay defense. https://www.portsmouth-dailytimes.com/wp-content/uploads/sites/28/2017/09/web1_rsz_dsc_0106.jpgClay’s Taylor Lewis leaps up for an attack attempt.